EVE Audio - TS110 Subwoofer 10" > Eve-Audio > Diffusion Audio Inc.
EVE Audio - TS110 Subwoofer 10"
Our range of Subwoofers follows our policy of using only high quality components. This has enabled us to bring the best possible products to the market place. We have paid the highest attention to properly extend the frequency range of our speakers and have put even more care into our subwoofer designs. Not only care, but also a lot of testing and abuse. 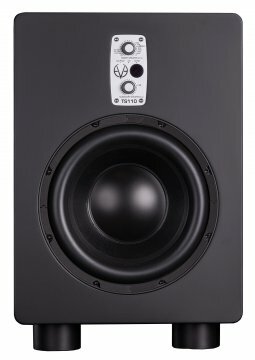 The TS110 model features a very efficient 400W PWM amplifier that drives a proprietary 10" woofer. This guarantees a frequency response of down to 28Hz, up to 300Hz, for a maximum output power of 108 dB (SPL @ 1m) with plenty of power for most needs.